Timebank is a skills swap program designed for self help within the community. We all have some skills ......gardening, sewing, DIY, even driving is a skill that can shared. Would you share with others and get a bit of help in return ? If so please contact us, as we are always on the lookout for new members with new skills, so we can improve our lives and the lives of others. ​I hope you are all well and enjoying the mild weather. 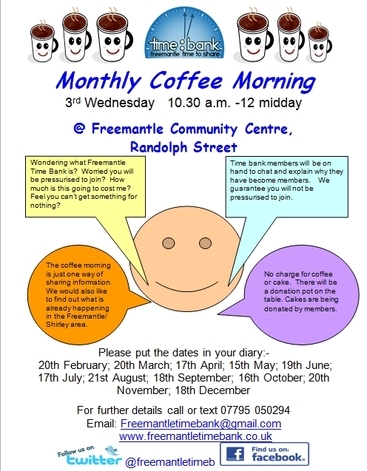 Due to a previous appointment I will not be able to be at the Freemantle Wednesday morning coffee and craft drop-in this week. If anyone is planning to attend on the 23rd or 30th November, can they please let me know. My colleague Lynda is still looking into a new venue for the Millbrook group to meet in, more information on that as soon as I have any. The Thursday evening Freemantle Craft Group had a network meeting last week, and have planned their activities for the rest of the year. As always this group is open to all for just £1. Tea and Coffee available. Please let me know if there is any exchanges I can help with. Linda (Lordswood) - She is able to help with escorting people to appointments, giving lifts, shopping, running the occasional errand, visiting with others, and going to the cinema or theatre. In return Linda may ask for help with simple DIY, moving/lifting and computer maintenance. Ruth (Off the Avenue) - She is able to help with form filling, office skills, letter writing, gardening, cycle maintenance, assisting at events/attending meetings, etc Improve open spaces/litter picking, cooking, ironing, occasional housework. Ruth is really keen to meet with people interested in cycling and volunteering with cycling groups. I know a few of you have linked up to go cycling and I have received another request just recently so this could be a good opportunity to get involved in something on a larger scale. We have a further five visits/sign ups planned for this week. Please spread the word to friends and family and encourage them to become members also. One of our female members is getting into cycling and would love to meet other women who would like to join her for a Sunday cycle ride. Nothing formal. She'd like to build up some stamina before joining one of the many cycling clubs that are around. Do you know how to use Mailchimp? A member is looking for help to create e-bulletins. Time bank members have helped with people moving home, giving lifts, moving of furniture, sewing, knitting, crochet, weeding, shopping. Thank you to everyone who has undertaken an exchange, your help is greatly appreciated. Sad news: the Rise Community Centre has now closed it's doors, therefore we are no longer able to use this as a meeting venue. Over the summer months the Coffee and Craft Group will take place at various members homes/coffee shops etc. If you are interested in participating at any of these events please send me a text and I'll let you know where that week's meeting place will be. This week Bev has kindly opened her home for the group. Last week members agreed to go out into the community to discuss with other facilities if they have a viable meeting place we can use. We will discuss all options at the group today. Tuesday 2nd Aug - 10.00-12.30 p.m. Southampton West Joint Time Banks Get Together, Wetherspoons Shirley, High Street, Southampton - everyone welcome. This is also a great opportunity to bring along your family/friends to get to meet others and the broker. Thurs 4th Aug 6.00-8.00 p.m. Craft Group - @ Freemantle Community Centre, Randolph Street - We will be tile painting. If this isn't of interest to you, then bring along your latest craft activity and enjoy the companionship. Sat 6th Aug - 10.30-1.00 p.m. Repair Café, United Reformed Church, Shirley Road. We will be there promoting the city time banks. Mon 8th Aug - 1.30-4.30 Millbrook "Coffee and Craft" @ Hazel's. Hazel has kindly opened up her home to hold a group BBQ. Take along some food and enjoy the companionship. Please contact the broker for address details. Mon 8th Aug - Gwyneth will be on Unity Radio promoting the time bank along with Pat one of our newer members who lives in Newtown. Thurs 11th Aug 6.00-8.00 p.m. Free Craft Thursday, Bring along your latest craft activity and join the group in sharing your skills. If you are stuck on a craft, we may have someone who may be able to help with advice and guidance. 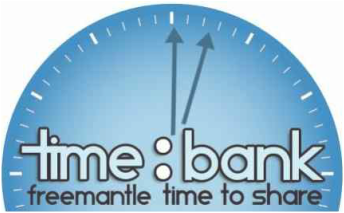 Fri 12th Aug - 9.00-5.00 Southampton Time Banks will be Southampton Precinct Market promoting the time bank. NB Due to the low numbers in attending, the joint time banks session at the Standing Order will no longer take place. Thank you for those who have attended in the past, your support is appreciated. 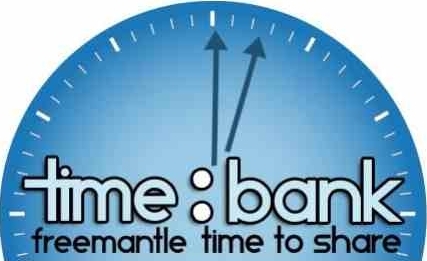 If we can help you with an exchange, you want to share information/events with other time bank members then please get in touch. Colin (Shirley) can help with form filling, letter writing, visiting people/companionship, literacy, assisting at events and can help people with benefit advice and entitlements. In return he may require some help with gardening and an occasional hair cut. Steve (Bargate) has several skills he is keen to share with others as well as learn. He is a keen guitarist and can teach or entertain, is very interested in music which includes flamenco, classical and rock, jazz, etc. Has a keen interest in holistic therapies and would be interested in reflexology and would like to learn about Taoist philosophy. He is also happy to have conversations and be a walking companion. Steve is also a keen cook and can help with this. If anyone has recipe books on Tapas, French, Mexican, Turkish, Central African or Aboriginal cooking he would love to share. Steve is also able to share information on how to pass exams. Thank you to everyone who has helped in the last couple of weeks, swimming, cleaning, repairing bags, helping at events, home repairs, sewing. If you have not confirmed whether an exchange has taken place and length of time, can you please let me know asap as it's quarterly report time and I need to ensure our figures are as up to date as possible. Thank you. It is with sadness that I have to report that one of our members recently passed away. RIP Mr Wilson. A huge thank you goes to Nicola who was first introduced to Mr Wilson to walk his old dog and undertook this diligently for several months. When the dog died at the end of last year I spoke to both Mr W and Nicola and asked if they would like a companionship exchange put in place. They both agreed to this and Nicola also did the occasional bit of shopping for him too. It was Nicola who kept me informed of Mr W's health, both when he was taken into hospital at Christmas and of his passing. With happier news, we would like to congratulate time bank members Hilra and Rod who recently wed and are having their wedding blessed on 17th. Weds 6th July- 10.00-13.00 NO Drop-In @ Freemantle Community Centre, Randolph Street - Please note that I will not be in the community centre this week. Thurs 7th July 6.00-8.00 p.m. Craft Group - @ Freemantle Community Centre, Randolph Street - Emma will be opening up and Irene will be leading on t-bag folding. If this isn't of interest to you, then take along your latest craft activity and enjoy the companionship. Monday 11th July - 1.30-4.30 Coffee and Craft @ Rise Community Centre, Windrush Road - Free Craft Monday - Bring along your latest craft activity and join the group in sharing your skills. If you are stuck on a craft, we may have someone who may be able to help with advice and guidance. Thurs 14th July 6.00-8.00 p.m. Free Craft Thursday, Bring along your latest craft activity and join the group in sharing your skills. If you are stuck on a craft, we may have someone who may be able to help with advice and guidance. 12th July - 1-2 p.m. Marwell Zoo’s Zany Zebra sculptures will be parading through Southampton City Centre. The route will include Guildhall Square, Bernard Street, Castle Way, the Bargate and Above Bar. The zebras will then be displayed around the city. In August Time Bank members will be following the Zebra Trail looking at all the zebras before having a picnic in one of the parks. Details to follow. Tuesday 28th June - 10.00-12.30 p.m. Joint Time Banks Get Together, Standing Order, High Street, Southampton - This is your opportunity to meet with time bank members from across the city, learn from each others experiences and to organise exchanges amongst one another. It would be really good to see you there. Southampton City Council is consulting on a draft Adult Social Care and Support Planning Policy. The draft policy is designed to exert substantial influence on practice and decision-making within adult social care at Southampton City Council. They want to give people who receive adult social care (now, and in the future), their carers, advocates and other stakeholders every opportunity to influence the final version of the policy - they need your help to get it right! The consultation is open to 23 August 2016.